Week 3 of The Adventures of Shane in Veggie Land. Which is confusing with it being Part 4 up above. Might have to change that up. 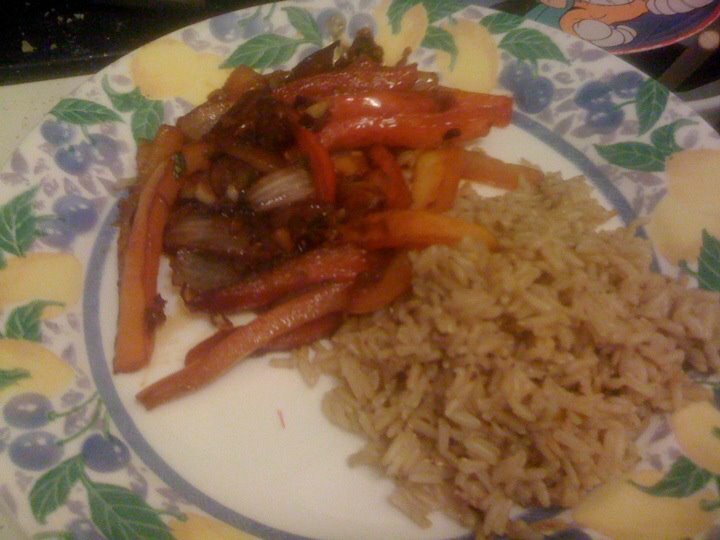 This week, went with a bell pepper stir fry from “flavorfull” again. Branching out next week. 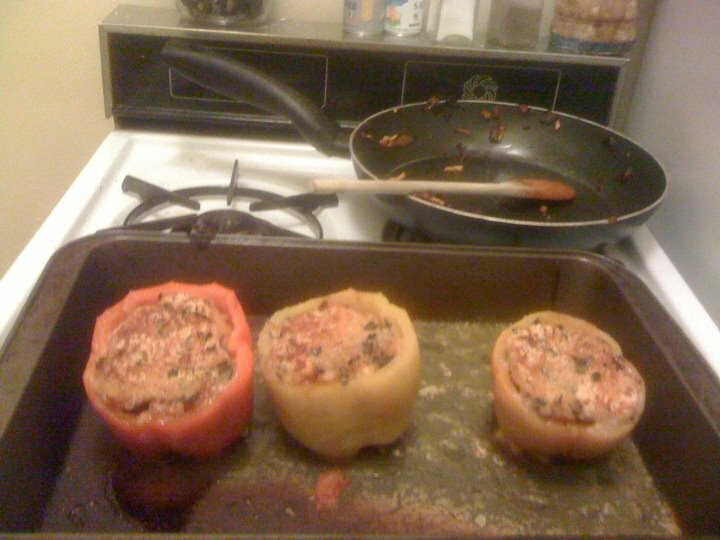 We decided to go with this recipe because it claimed to be very easy, we like peppers a lot, and we had basil to use up. (We refers to me and the girlfriend, in case you’re new to this. I’m not just crazy like that.) I had to buy a lot of the ingredients like soy sauce, rice vinegar, and coconut oil, but they’re the kind of things that won’t go bad and can be used in a lot of different stuff. Things didn’t start out well. Every time we’re having a meal involving rice, I forget that it takes about an hour to cook. So we were pretty hungry when I decide to start cooking, aaaaand then remembered the rice. I used the time the rice was cooking to cut everything up and get it ready to cook, however, and it worked out pretty well. Until a burning smell started to fill the apartment. Turns out, I forgot to turn the heat down on the rice enough. So it wasn’t so much simmering and still full-on boiling. The water ran out and we had a bit of a burned rice issue, but I managed to save most of it. Just threw some more water in and put the heat at the correct temp. I still hate cooking rice. The rest of the meal was really easy. Just a matter of putting stuff in at the right time and keeping an eye on the temperature (haven’t quite fine tuned my control of the gas stove yet). I’ve cooked quite a bit over the last year, but I’ve found that I’m really enjoying the cooking part of this blog. I’m learning new stuff every week, especially with these vegetarian meals. Useful stuff. Everything turned out great. Very tasty. My only problem with it–not that filling. I had to eat a some walnuts and banana chips before I left for work to try to hold me over. This has been a lot easier than I expected. Might have to get crazy soon and step away from the bell peppers. UPDATE: Almost forgot! I had never had ginger before this (that I know of). Turns out–I ****ing LOVE ginger. I am finally moved. Which is also why this post is a day later than normal. Still without internet at the new house so I might be running behind all week. Eating: Not a bad start to the week. Made some pasta with peppers, mushrooms and onions. Also cut the amount of meat that I usually use for pasta (progress!). I took pictures with my phone to include this week, but now my phone won’t connect to my computer. Maybe next week I can get some in. I made a sausage and mushroom pizza the next day, probably with more cheese than is healthy. 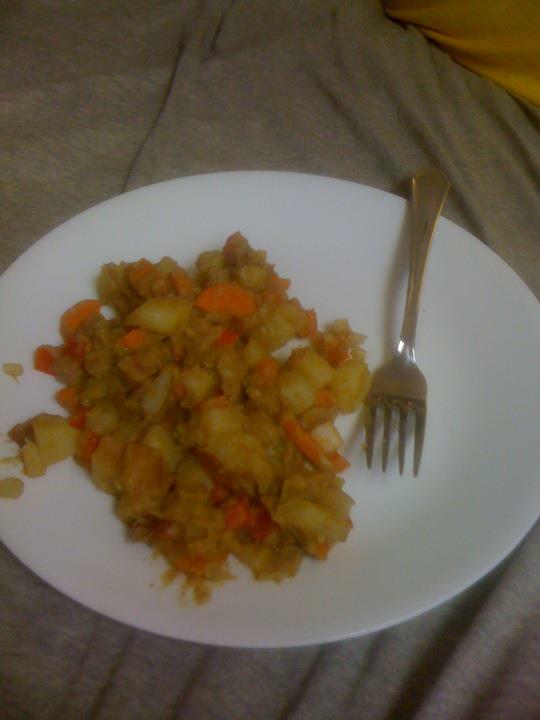 Then…the accidental vegetarian meal! If you didn’t read about it, you can find the link here. After that, moving took over and it became a eat-everything-that’s-left-so-we-don’t-have-to-move-it kind of situation. Which lent itself to a nice egg, potato, and cheese scrambler. Other than that it was a combination of eating out and (organic) lucky charms mostly. Not a great finish. Working Out: Not much to report here again. Trying to clean the side of the fridge was an intense arm/hand workout (yay). Moved/cleaned for about 20 hours straight. Give me a break, it’s close to working out and it’s all I’ve got. Survey says….COUNTS! 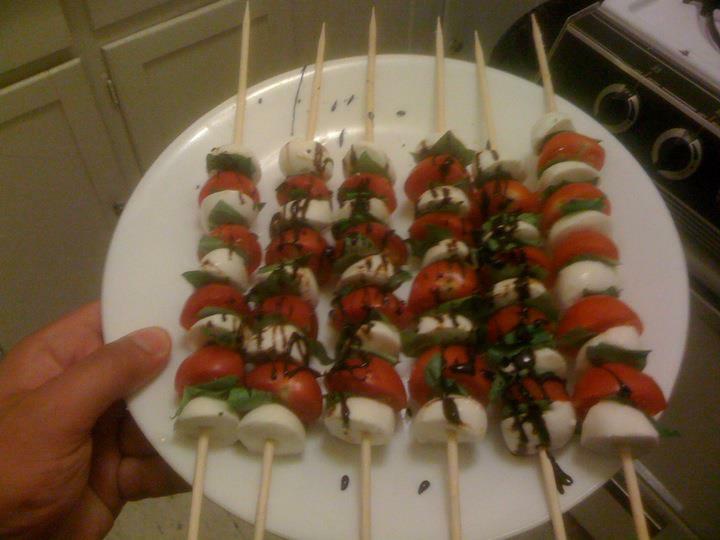 Moving–Took up most of my free time and created an incentive to eat all the unhealthy food left and eat out. This Week’s Plan! : There’s a lot of unpacking to do still ( :p ), so working out doesn’t look great. But the new place is close to some good running trails, tennis courts, and the dog park. So I’m going to try to run or play tennis and run around with the labradile (part lab, part crocodile–pics soon, I promise!). Eating at this point is mostly an exercise in not eating very much (probably a good thing for me) until everything is unpacked and a grocery run can be made. Got to try for another vegetarian meal. We’ll see how that goes (have to pace myself). Eating/working out plan evaluations to come soon. If you missed the first part of “The Vegetarian Adventure”, it’s right here. I’m not going to lie. Wasn’t going to do the vegetarian thing this week. It wasn’t a total cop-out though. (I swear!) I looked up a bunch of vegetarian recipes and even found some potential dishes. Quick shoutout to healthyeatingstartshere.com for some great advice on vegetarian eating. The girlfriend also found a couple recipes for us to try. We decided to put off some of them until after moving day (Sunday). Trying to avoid keeping food around the house. Anyways, we picked out our meals for the week at Whole Foods based on what was on sale. Initially, we were planning on making an all-veggie curry. Pretty simple; a nice easy start to the weekly veggie meal. But then…we decided we wanted some chicken in the curry. So the vegetarian meal was pushed back to next week. Fast forward three days. I cut up all the veggies for the curry, get the potatoes cooking, and I’m all set to dice the chicken. About this time, I realize that I forgot to get the rice cooking. Since the rice takes an hour and the girlfriend was leaving before then, I make the executive decision to leave out the rice. Things are already going downhill. Back to the chicken. We bought thighs this week, because they were on sale. (Usually, we get boneless breasts). So I wasn’t that familiar with the chicken. But something seemed a little off right away. I smelled it, and it was just a little funky–smelling a little bit like eggs. On top of that, the underside of the thighs seemed a little discolored and they were kind of sticky. So (insert favorite curse word, e.g., ****sticks). I tossed the chicken. Now normally, I’d shrug it off as nothing and eat something else. This week was a perfect storm. No backup food due to moving day. For some reason I cut the veggies first and got the potatoes cooking, the opposite of what I usually do (forcing me to stick with the meal). The chicken goes bad in only THREE days in the fridge. And all of this during the week where I said I’d be starting a weekly vegetarian meal, and then backed out of it. Coincidence? I’m not so sure. 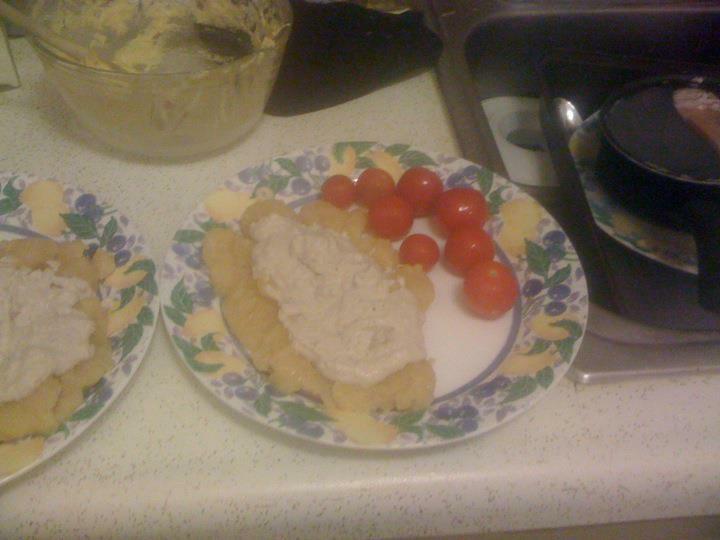 Oh, and then I discovered that I didn’t have any cream for the curry either. Epic fail of a curry. I am a meat eater. My family, big meat eaters. In fact, my extended family actively avoids any green foods, possibly at a subconscious level. My mom discovered that if she brought a green-colored salad, and this could be a jello salad or pure sugary goodness with green food coloring, to a family gathering–wouldn’t get touched. Now, I’m not as bad as my extended family. Lettuce on a burger, sure. And I will occasionally eat a salad…or a few chunks of broccoli…or yeah. So, not actually much green food getting eaten here. Seriously thinking it might be a subconscious thing. But I do try to work veggies into my meals. I eat a lot of peppers and onions, and a few other things here and there. (Which I can’t really think of, so that’s a bad sign). And then I took a large bite of my turkey sandwich (For reals). All kidding aside though, I know I need to increase my vegetable intake and decrease the amount of meat I eat. It’s healthier for me and better for the environment at the same time. Unless I find a vegetable that tastes like a cookie, I’m going to have to face my subconscious fear of green food. And it looks like this is the week. Check back for updates throughout the week.